With the rise of the internet of things, more and more work is taking place online. Self-employment can offer a range of benefits, but by nature, when working freelance, time is money. Every minute spent on lunch is an extra pound lost, and if you can work fast, you can earn exponentially more money. In this blog we’ll take a look at how fast subtitling services can earn you more money and make you much more efficient. Transcription, translation and subtitling services all require a lot of time. Linguists and captioners who can work fast can easily get the jump on the competition. As a closed captioning company run by experienced subtitlers, we have some great tips on how to increase your work rate and get more bang for your buck! In order transcribe quickly, you need to type quickly. In theory, this one should be a no-brainer but it’s surprising how many transcriptionists set out on working online without being able to touch-type. For many non-professional typists, the consensus is often that people feel their one and two finger typing skills are sufficient to get the job done. Whilst it’s possible to hit speeds as high as 70wpm without touch-typing, touch-typists often hit numbers as high as 100wpm and with far greater accuracy and less mistakes. To get transcription work done fast, both speed and accuracy are required and touch typing is the best way to achieve both. For so many transcriptionists and subtitlers starting out, there seems to be a reluctance to spending out on transcription pedals. Whilst I can understand the idea that you don’t need pedals to start and stop audio for transcription, the time spared when using pedals is enormous. We ask that all our typists and transcriptionists use pedals for two reasons. The first is accuracy. When using a mouse to start and stop audio, there is a temptation to play longer lines of text and memorise before stopping in order to save time. this leads to small inaccuracies in the transcription. The other impact on accuracy is due to the stop time. In professional transcription software, pushing the ‘stop’ pedal actually rewinds the audio by about a second to ensure that nothing is missed in between the stop and start gap. It’s not possible to do this with standard software so things can get missed. The second reason is around timing. Whilst it’s possible to have a fast typing speed without touch typing, having to move fingers away from the keyboard to pause with a mouse or even using shortcut keys, takes up time. This makes the rate a transcriptionist or subtitler receives equate to less per hour and also means said typist may be unable to reliably hit tight deadlines as easily as their pedal-using counterparts. For both closed captioning and transcription work, professional, high quality software is a must. We all know that it’s possible to use Windows Media Player to play a track and transcribe it. We all know there is lots of free subtitle software out there which allows captions to be created for free, but the difference in quality of work can be substantial. Professional transcription software, for example, Express Scribe has compatibility with transcription pedals but so many other useful features that standard media players don’t offer. Transcriptionists can slow down or speed up audio, increase volume, reduce background noise, add time codes with shortcut keys, allocate and share work directly with other users and many other functions. All of these save massive time, especially for urgent transcription services. For subtitling, professional software such as Wincaps has a huge number of features that many free products just don’t have. The software allows direct import of text files and assisted line splitting. Sound waves are logged for better accuracy and sync and reading speeds are displayed and flagged up. 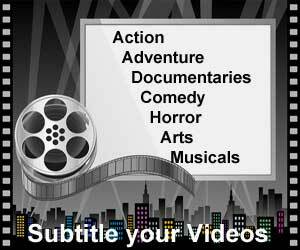 In addition, an enormous range of subtitle formats are available on the software with easy re-export and subtitle translation is a cinch with a massive range of languages available and options to link subtitle project files by language or source video. For professional subtitling services and fast delivery, professional subtitling software is a must. Using templates for any kind of work will always save you time. If you do lots of repetitive tasks such as formatting documents to specific fonts, colours or sizes, setting up multiple templates and being able to select them from a list without having to change their inputs every time will always save you lots of time, time which could be spent on more productive things. Using subtitling templates for example means you could set up one template for a specific type of video which may require longer sentences or a specific font and background to the subtitles. You could then also have a different template for videos which require shorter sentences and line splits, colours or fonts. Setting these up in advanced will save you lots of time and effort. So there you have it, our tops tips for fast subtitling services. Scrubbing up on your touch typing skills, making sure you have the right software and hardware, setting up shortcut keys and templates all help in becoming a more efficient subtitler and earning more money. If you would like to work for us, take a look at our work with us page and see what we can offer today.